Within the last 3 years, I turned from not cooking at all to someone who loves to try out new recipes and flick through cookbooks. Moving out defenitely has a fair share in this change, but at the same time, I just became a true foodie. One thing that´s also changed is the amount of cook books I have sitting on my shelves: Currently, I have 4 cookbooks - one of them being Eat Beauiful by Wendy Rowe, which is my latest addition. I talked about it on here already in a book post a few weeks back and after reading it and trying out a couple of recipes, I am now back to give you a little review about it. As mentioned before, Wendy Rowe, a famous make-up artist, focuses on how to nourish your skin from the inside out. 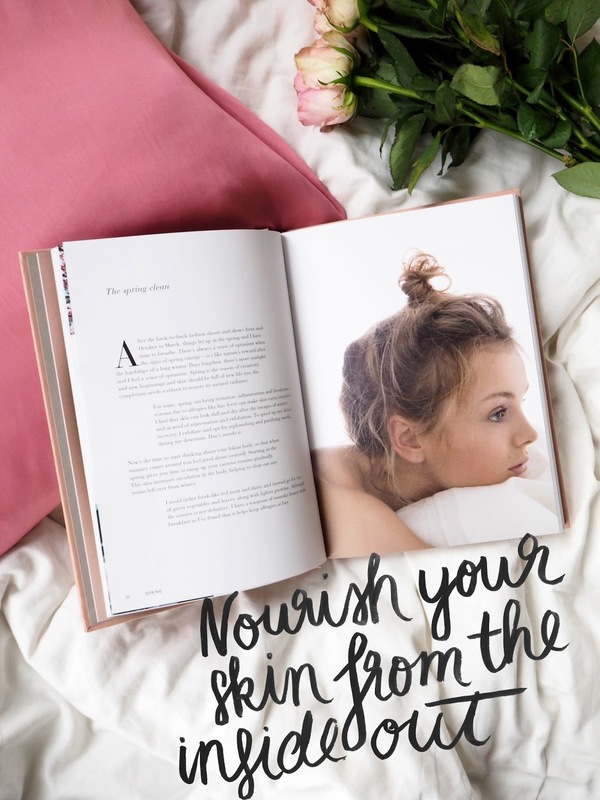 The book contains not only 70 recipes, but also lots of information on how different groceries benefit your skin, Wendy´s bathroom must-haves and general beauty tips. The book starts with a general introduction to beauty and continues with the chapter "food and beauty". In this part, Wendy explains different methods that ensure well nurtured skin through healthy organs and intestines. Among these methods are "good digestion", "eat the rainbow", "stress-busting tips" and "mindful eating". Wendy believes in eating according to seasons which is why the book is also split up into 4 chapters: spring, summer, autumn and winter. Every chapter begins with an introduction to seasonal groceries and their benefits and it is followed by about 20 recipes. I really enjoyed reading the introduction to seasonal groceries because I´ve never gotten my teeth into how certain groceries benefit out overall health and which nutrients they give us - until now. The book ends with some DIY Beauty treatments (I am really excited to try some of them out!) 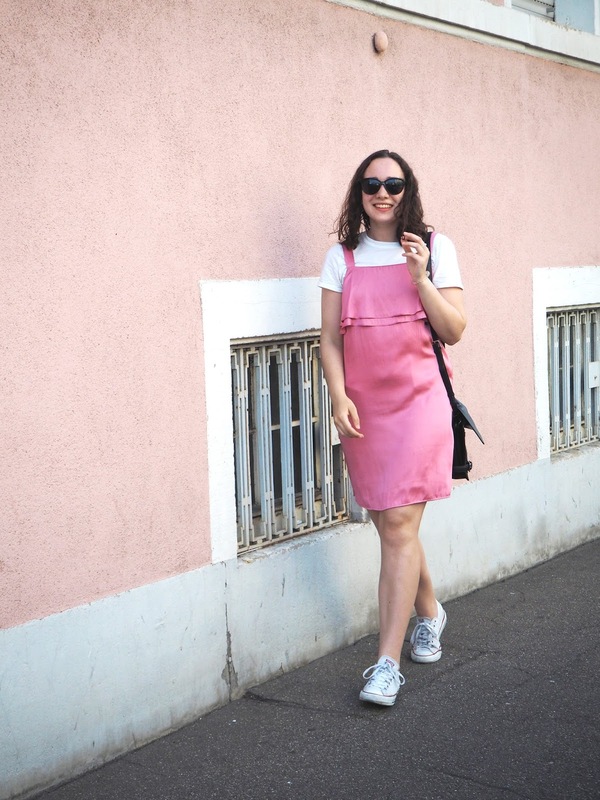 and Wendy´s tips about skincare, healing herbs and spices and a guide to nutrients. I´ve already tried a few of the recipes among them being the Quinoa with pesto chicken and the date energy bites. I loved both of these recipes so much, I already made them multiple times. Although this is not a vegetarian-only cookbook, there are defenitely enough recipes for veggies as well. What I like about the recipes, too, is before each recipe, Wendy wrote down some thoughts about the follwing recipe. Also, you usually don´t need any fancy groceries, which is a plus! However, I find this is not a book to read cover to cover in a day. While it is really educational (especially the introduction to the seasonal groceries), it get´s quite lenghty as well (the said introduction is usually about 20 pages long). I would much rather flick through it every other day or read each chapter at the start of a new season. Nevertheless, the cover is really beautiful as well, so it makes a great piece to put on your coffe table or on display otherwise. From my own experience, I can say that this book makes a great gift for someone who loves beauty and cooking (I got it as a gift for my birthday), but also for a "from me to me" treat. 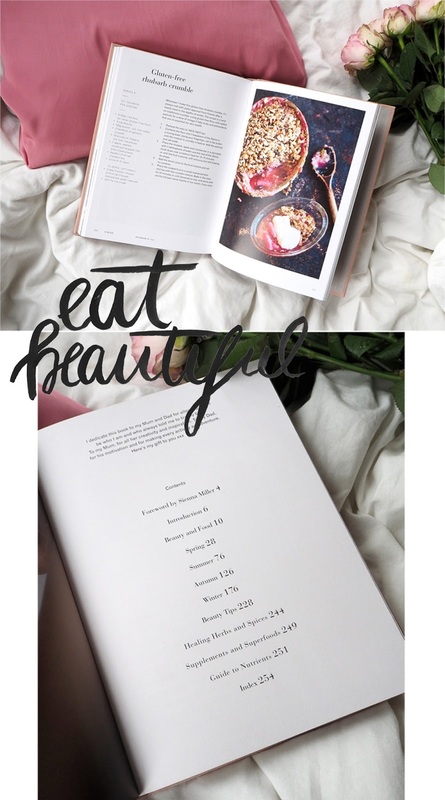 It´s not your average cookbook, but that´s exactly what I like about it. I´ve struggled with my skin since I reached puberty. During the last 4 years, my skin improved significantly, however, it´s still far away from being perfect, so I love the thought of doing something good to my skin by following these recipes. I was already thinking about buying this book! now its in my shopping basket! Oh great! It´s really one great book so have fun with it.